One of the most difficult aspects of navigating the modern craft beer landscape—and a big part of why we think the term “craft” has probably just about outlived its usefulness as a descriptor in general—is that so many breweries are now owned by larger corporations that it’s very difficult to tell who owns what at a glance. The point isn’t that you’re able to discover ownership if you look into it—the point is that no one can reasonably be expected to do research on the ownership of 100 different breweries while they’re browsing at a package store, especially if they’re just an average beer consumer. The question of ownership and “independence” has become so complicated at this point that even full-time beer writers could be forgiven for not being able to remember the full list of who owns what. Thanks to the infographic below, though, you can at least attempt to absorb almost all of the pertinent information by gazing at a single image. Created by Michael Tonsmeire of The Mad Fermentationist, who also happens to be opening a small, indie brewery called Sapwood Cellars in Columbia, MD, it cleanly and concisely links every parent company to the slew of breweries it owns. Of course, in the case of corporations like AB InBev, being completely exhaustive is impossible, given that they own somewhere in the neighborhood of 150 companies around the world in an effort to corner every possible market. The infographic is also non-preferential in terms of breweries that still qualify for the “craft” label, as defined by the Brewers Association. As a result, you’ll see groups here such as private equity group Fireman Capital, which now owns the likes of Oskar Blues, Cigar City, Perrin Brewing Co. and others. You’ll also see Duvel, which has done quite well for itself in acquiring acclaimed breweries Ommegang, Boulevard and Firestone Walker, among others. Click for a larger, zoomable image. There are, of course, a few minor mistakes—10th & Blake, for instance, simply manages Pilsner Urquell, which is actually owned by Asahi—but the infographic gets across almost all of the most important information at a glance, which is the important thing. 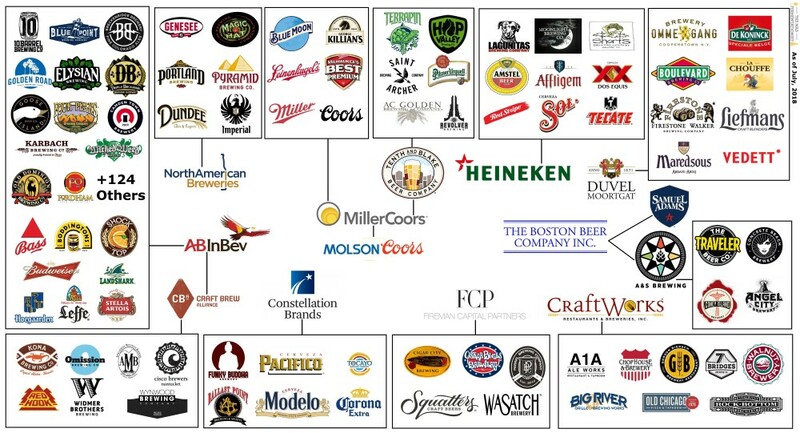 Of course, a graphic like this is also in need of constant updating, given that brewery buyouts are still continuing at a frightening clip—it’s only been a few days since the last one, when Constellation Brands announced it was acquiring Dallas’ Four Corners Brewing. In a market where it’s harder than ever to know who you’re really buying from, hopefully this helps at least a few consumers who are curious to find out.